2012 Tocqueville award winners Evjue Foundation pause to take a photo with United Way President Leslie Ann Howard. Pictured: Clayton Frank, Leslie Ann Howard, Jack Lussier, and Dave Zweifel. 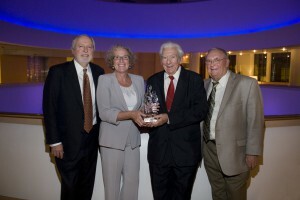 The Evjue Foundation, Inc. (the charitable arm of The Capital Times) received the 2012 United Way of Dane County Tocqueville Society Award at the Society’s annual membership reception on September 27. The event, held at Overture Center for the Arts, was underwritten by Johnson Bank. The Evjue Foundation’s partnership with United Way of Dane County started before either organization existed. During September of 1922, the Community Union held its first fundraising drive representing 14 member agencies. The lead volunteers were high profile members of the community, many with continuing philanthropic and business legacies—Marvin B. Rosenberry, Michael Olbrich, Elsa Fauerbach, Paul Stark and William T. Evjue. Mr. Evjue, the oldest son of a Norwegian immigrant, settled in northern Wisconsin in the late 1800’s, he chose a career as a newspaperman. He worked briefly at the Milwaukee Sentinel and then as business manager for the Wisconsin State Journal in Madison. In early 1917 he quit his job, founded his own newspaper and The Capital Times printed its first edition on December 13 of that year—just months after the United States entered World War I, an action publicly opposed by Robert M. La Follette (U.S. Senator from Wisconsin). Mr. Evjue’s newspaper was not afraid of taking a tough stand, and found itself in the midst of controversy due to its support of La Follette. With the motto “Wisconsin’s Progressive Newspaper,” the newspaper has been at the forefront of Wisconsin’s famed Progressive movement and made a name for itself in fighting for the underdog. By 1919 the newspaper had a circulation of over 10,000 households. For the next three decades, The Capital Times grew in reputation and circulation. Madison Newspapers, Inc. was formed in 1948 bringing The Capital Times and Wisconsin State Journal under one roof, but with separate newsroom staffs. The Capital Times continued to publish on weekday afternoons and Saturday mornings. Today The Capital Times provides immediate news coverage on the internet and publishes a weekly newspaper with in-depth coverage of community issues, columns by opinion leaders and thought-provoking editorials. The dedicated writers and reporters continue to earn accolades for their work with recognition from entities such as The Milwaukee Press Club. Mr. Evjue started The Evjue Foundation in 1958. When he died in 1970, the will he wrote directed that all the proceeds from the controlling voting stock that he owned in The Capital Times Company be turned over to the Foundation. Today, The Evjue Foundation, Inc. is the charitable arm of The Capital Times. Distributions from the Foundation go to organizations that best exemplify the beliefs that Mr. Evjue championed in his lifetime, causes that could improve the quality of life for all the people in the Dane County area. His bequest was initially valued at $13,450 and since then has resulted in more than $31 million in grants. The Foundation has touched countless lives in our community from fledgling organizations that promote theater to large organizations that feed the hungry, from small nonprofit groups that work with at-risk youth to large institutions such as the University of Wisconsin and Madison College. The Evjue Foundation and The Capital Times have provided significant support and volunteer leadership. When United Way began a capital campaign in 1997 to build a new office building, one that would be accessible to all in our community, The Evjue Foundation responded with an unprecedented pledge of $500,000! The Anderson United Way Center opened its doors in 2000, and since then the Evjue Board Rooms have served groups as varied as the United Way Board of Directors, Americorps members, public school teachers, emergency personnel and United Way Loaned Executives. Each year nearly 10,000 community members use the Evjue Board Rooms to learn, celebrate, train volunteers, raise funds and invest in our community. The United Way Tocqueville Society acknowledges exemplary leadership in philanthropy. The Society is named for Alexis de Tocqueville, the French citizen who traveled the United States and wrote about his observations of the American spirit of community in Democracy in America published in 1835. Society members are among the United Way movement’s most outstanding and engaged partners. On a national level, Tocqueville Society members collectively give more than one half billion dollars to United Way each year, helping local United Ways advance the common good. Our Dane County Tocqueville Society began with the visionary leadership of Oscar G. Mayer and Jerry M. Hiegel. The original membership included six families who contributed more than $60,000 in 1990. This year, the Society exceeds 200 members who together invest greater than $3.5 million in United Way to positively impact people’s lives. The leadership, service and gifts of Tocqueville Society members are at the heart of United Way of Dane County’s work in our community.